As my last post revealed, we have a new tandem in the stable: a Co-Motion aluminum 650b custom! Mary and I got it out for a short shakedown ride on Saturday. I always have a bit of apprehension about the first ride, mostly fearing chainsuck damage, dinging a wheel in a pothole, or some such deal. But I’m also wondering if the fit will be right and the bike handles well. Since we buy custom-sized framesets and have them built up with our own mix of parts, we don’t get to test ride first. That means trusting the framebuilder’s design and our shop. We have a good relationship with Co-Motion on the frameset end and College Park Bicycles for parts installation, so I was pretty confident all would be terrific. Still…what if? An aside: if our frameset resembles the new Co-Motion Kalapuya 30th anniversary tandem, that’s no accident. It is based on that design, but with our sizing, 650b wheels and a steel fork. Dwan at Co-Motion was a treat to work with on this project. I put the bike in the workstand last weekend in the Dining Room Bike Shop to install fenders and tweak the setup. 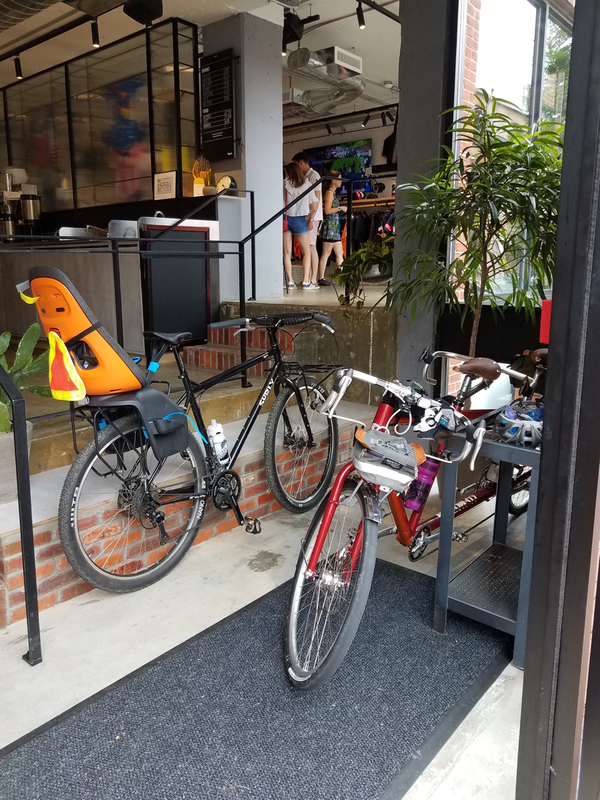 The first bit of sorta bad news was that wide-enough fenders won’t fit over the rear wheel with 47mm WTB Byway tires, without modification to clear the seatstays. 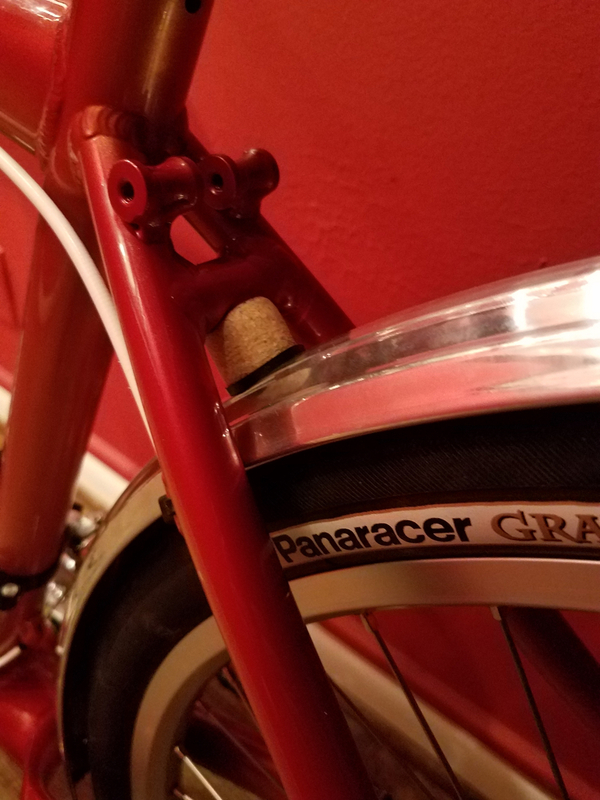 The good news: I guessed that Velo Orange 650b 52mm fenders would clear Panaracer GravelKing smooth 42mm tires, so I ordered a set and it worked out fine. 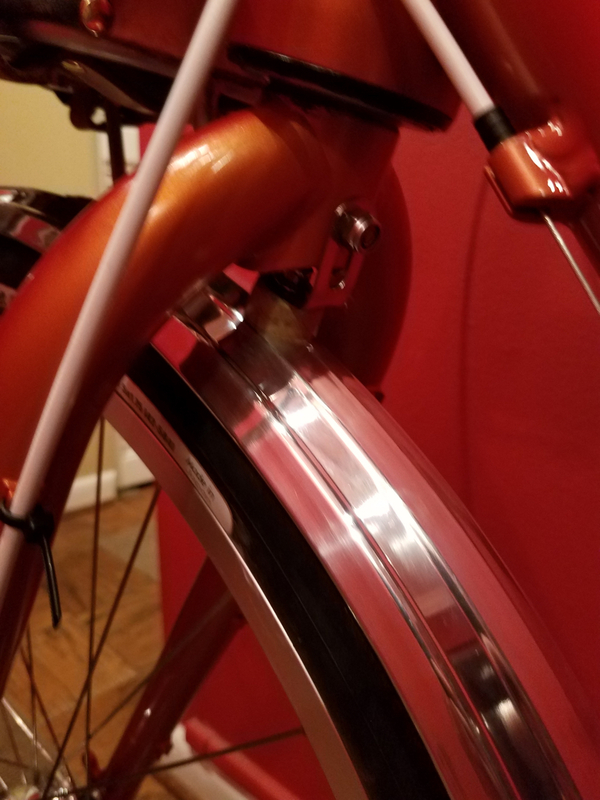 After the usual struggles trying to get achieve a good fender line over the rear tire, I stumbled onto the right height of cork spacers and fender stay length (the hacksaw got a workout, a few millimeters at a time) to get a decent installation. The front fender went on really easily; the fork has a ton of clearance. I could put in a 700c wheel with 32mm tire and still get a fender installed. If you think I worry too much about fenders, you may be right. But, I hate getting ourselves and the bike sprayed up. Everybody has their thing, I guess. We put the bike up in a stationary trainer Saturday morning and tweaked the saddle and handlebar locations for us both, aired up the tires, and went out to Hains Point, our local bike loop in southwest D.C. I didn’t fully tighten a bolt on the rear fender and we stopped to address that noisy issue. To my great relief, the bike otherwise rides and feels really snappy. It passed the standing climbing test, though the tires at 65 psi rear/60 psi front felt a little squishy. More experimentation to come on tire inflation. We stopped at the Rapha store in Georgetown (I kept my wallet in my back pocket, this time) and then we rode up to Adams Morgan for lunch. The weight savings over our steel tandems is noticable, even with the steel fork we chose instead of Co-Motion’s carbon offering. My other fixations are metal over carbon and front racks. Co-Motion can place mount points on their steel fork as needed and we had them do that for the Nitto mini front rack we like. Mary is happy with the new bike, yay! All that’s left now is to wrap the bars and order a front generator headlight, probably a Schmidt Edelux II, and install a tail light. We have an Edelux II on the Java and it’s really nice and super bright. We have a Busch & Mueller IQ-X light on the Spectrum – it’s brighter still – but it has an annoying buzzy rattle that I have to figure out. I put a small Carradice Barley bag on the rear that needs some kind of support. It doesn’t hit the fender, so OK for now. Also some of you will notice I chose pedestrian Avid BB7 disk brakes. We have had good performance from the BB7, despite its drawbacks – pads are hard to change and the tabs preclude Ice-Tech rotors; over time the caliper loses its smooth feel. As with any mechanical disk brake with a fixed pad, we have to adjust periodically. At a street price of $40 per caliper without disks, though, it’s a tremendous value. I’ll upgrade to better but much more expensive Klamper brakes from Paul at some point. I have them on our other tandems and they are really strong and easy to use. Brakes: Shimano aero levers; Avid BB7 road disk calipers; 203mm Avid disks. Bags: front Rivendell Sackville Trunksack, small; rear Carradice Barley. Next up: some longer rides! I won’t buy a road bike that I can’t fit fenders on comfortably so I understand your pain. Next is getting that perfect fender-line. Gappy fenders make me very sad! 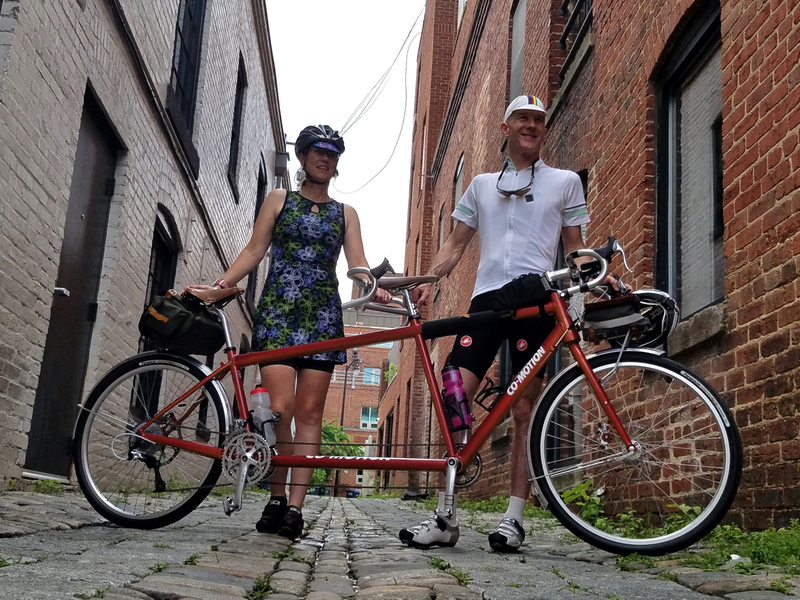 I’m a newish reader of your blog, and am not a tandem rider and can’t imagine ever being, but what I love about this post is the fact that you have included all the details of your build. I often look at bike pictures and think – “now I wonder what that rack is/pedals are/ handlebars are/saddle is etc. etc.”. So thank you for that! Thanks Lizzie for your kind comment and thanks for reading. Good luck with your sewing machine projects…so many little parts! Came across your post today as I was wrestling with wheel size on a new tandem we’re considering. 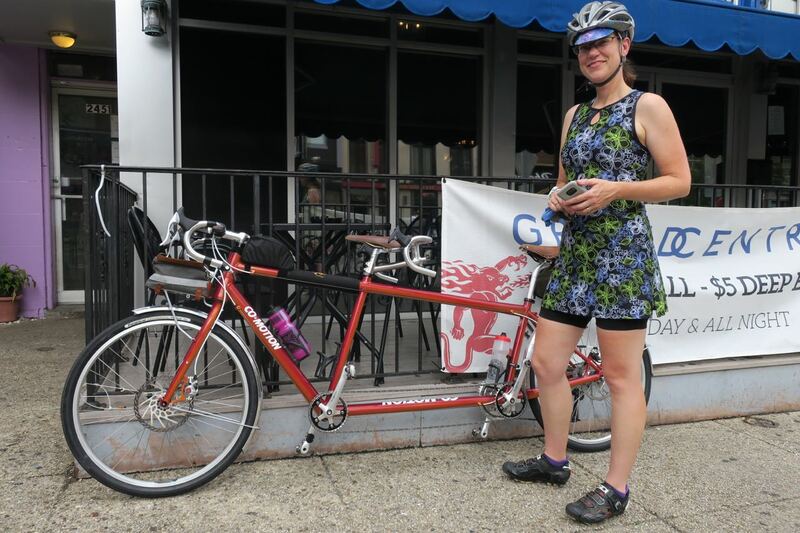 We’ve ridden a Co-Motion Carrera road tandem for years. We’ve decided it would be fun to add another bike that would be ridden mostly on limestone paths, rails to trails, etc. Although we have a large area of single track nearby we aren’t in the least interested in tandeming it. But Mike at the shop said, no bro, you want the Java. The 29rs roll so smoothly. It’s taller off the ground but you’ll feel more secure. I’m not young anymore, and have always had a bike racer’s physique (little upper body strength). So I’m leaning towards the 650b. Plus it’s considerably cheaper and I’m having a hard time swelling the Java price. Long story short, why did you choose the 650B wheel size? Good question. We wanted to run wider tires with fenders and not end up with big overall wheels – the 650b WTB Byway 47mm and the 42mm Panaracer Gravelking smooth tire in particular. We own a Java and it can handle huge 700c tires, but we’ve mostly ridden 35mm Clement USH tires and it is a lot of bike. The 650b tandem with the Gravelking tires feels more nimble and rides just as fast, and soaks up broken pavement.